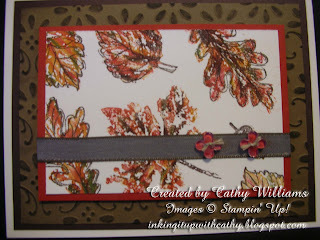 We made this card during my recent brayer class too. This time, we ran the cardstock through the Big Shot using the Finial Press embossing folder and then inked our brayers and lightly ran it over the raised image. You do not want to press too hard; otherwise you will get ink in the debossed areas. Keep reinking your brayer and adding color until you like the contrast. Some of the attendees turned it over and saw a very different look by inking the back side so try both ways and see what you like! We then took the solid images from the Gently Falling stamp set from the current Holiday Mini catalog and inked them with the More Mustard, Cajun Craze, Garden Green and Riding Hood Red markers. Using Early Espresso ink, we stamped the outline images over the solid images. We finished the card with some ribbon and Bitty Buttons.